There are two methods to pass the data into the function in C language, i.e., call by value and call by reference. Let's understand call by value and call by reference in c language one by one. 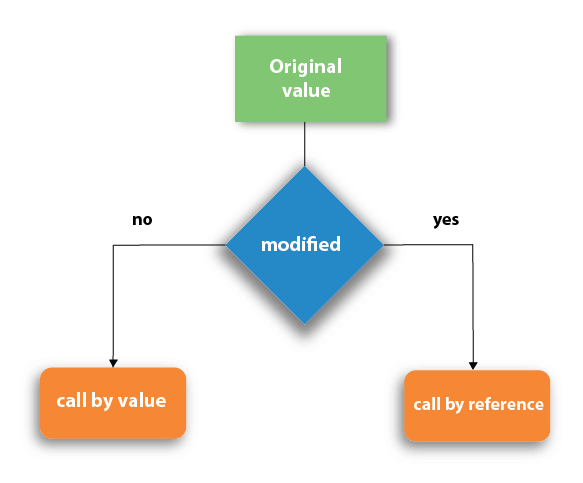 In call by value method, the value of the actual parameters is copied into the formal parameters. In other words, we can say that the value of the variable is used in the function call in the call by value method. In call by value method, we can not modify the value of the actual parameter by the formal parameter. In call by value, different memory is allocated for actual and formal parameters since the value of the actual parameter is copied into the formal parameter. The actual parameter is the argument which is used in the function call whereas formal parameter is the argument which is used in the function definition. In call by reference, the address of the variable is passed into the function call as the actual parameter. The value of the actual parameters can be modified by changing the formal parameters since the address of the actual parameters is passed. In call by reference, the memory allocation is similar for both formal parameters and actual parameters. All the operations in the function are performed on the value stored at the address of the actual parameters, and the modified value gets stored at the same address. Consider the following example for the call by reference. 2 Changes made inside the function is limited to the function only. The values of the actual parameters do not change by changing the formal parameters. Changes made inside the function validate outside of the function also. The values of the actual parameters do change by changing the formal parameters.